Angel is 18 and just out of juvenile detention. She wants nothing more than to connect with her girlfriend and then get revenge on her father who killed her mother. 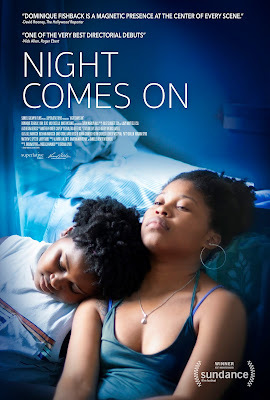 A small nuanced tale, NIGHT COMES ON is a winner. Looking like your typical inde film director Jordana Spiro shakes up expectations by not going where you think it will. – doesn’t give us your typical tale in your typical way. She doesn’t spoon feed us everything allowing us to ponder things, such as the fact that Angel’s girlfriend was kind of gone before she was locked up because Angel was distant even then. Also things around Angel’s Dad are not as clear cut as Angel thinks they are. Spiros‘s tale is also helped along a first rate cast who make everything 100% believable. The cast from top to bottom sell the tale not just by speaking and doing, but by showing signs of living the character’s lives in their eyes. Michael Caine has said that the secret to great acting is the ability to show signs of a characters thoughts in the eyes. This cast does that and then some. Everyone is fully invested with the result we as an audience is also fully invested. This is a super film. While it may not rock the pillars of heaven it will rock your heart.